The timeless appeal of cycling captured in this advertisement for an Albion bike. Kiwi, 1933. 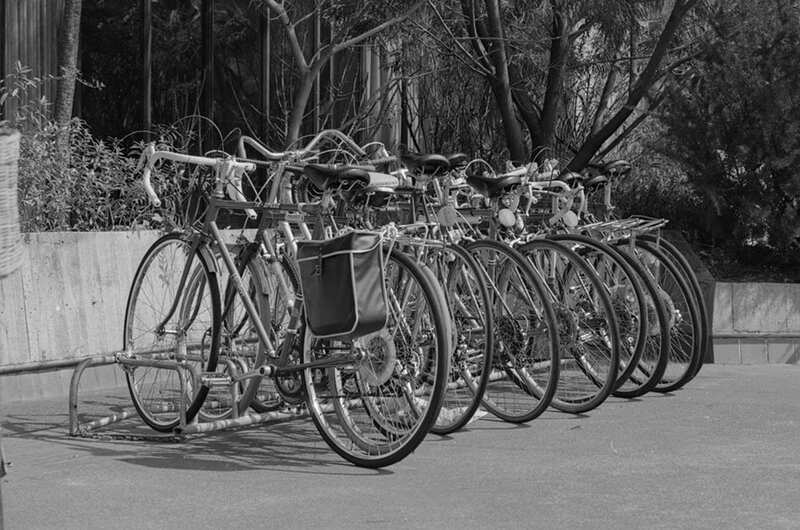 To mark the February 2019 Auckland Bike Challenge, we look back at the first stirrings of ‘biketivism’ on the University’s campus in the 1970s and early 1980s. 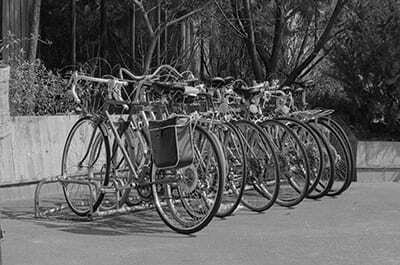 Although Auckland is not synonymous with cycling in the same way as Christchurch (once dubbed New Zealand’s ‘cyclopolis’2), the humble bicycle has been part of student transport for many decades. 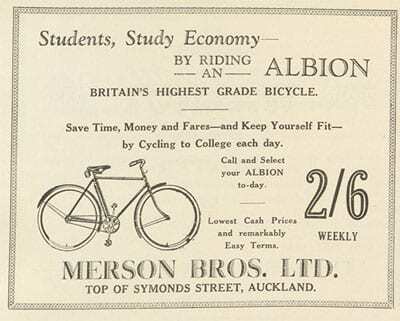 For example, this 1933 advert in Kiwi, the Auckland University College student magazine, proclaimed, ‘Students, Study Economy By Riding An Albion’.3 Cycling’s essential appeal to students – then and now – is captured in the copy: quick, cheap and a good way of keeping fit. Craccum’s ‘Cycling into the 80’s’ feature from June 1980 called for new cycle routes into the city and secure, convenient and sheltered bike parking at the University.9 To some extent, these hopes are being realised. The proposed ‘Western’ route in the 1980 article is now the Northwestern Cycleway from Henderson to Upper Queen Street, down through Grafton Gully to the Business School, negating a bike path down Symonds Street. The SkyPath across the Harbour Bridge is in the works. Secure bike sheds are opening up on campus. ‘Biketivism’ from the 1970s is bearing fruit. The Media Services team in Libraries and Learning Services have created a ‘Pedal power’ playlist in time for the Auckland Bike Challenge. Watch classic bicycle-themed international films, local TV programmes documenting New Zealand’s cycling history and inspiring cyclists’ stories. 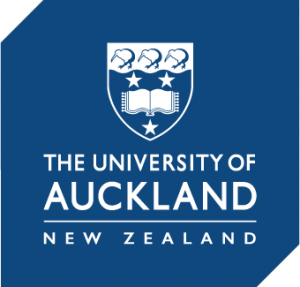 1 History of the University of Auckland Collection (Photographs). 2 Williamson, L. (2016). The bike and beyond: life on two wheels in Aotearoa New Zealand. Wellington: Bridget Williams Books, p.51. 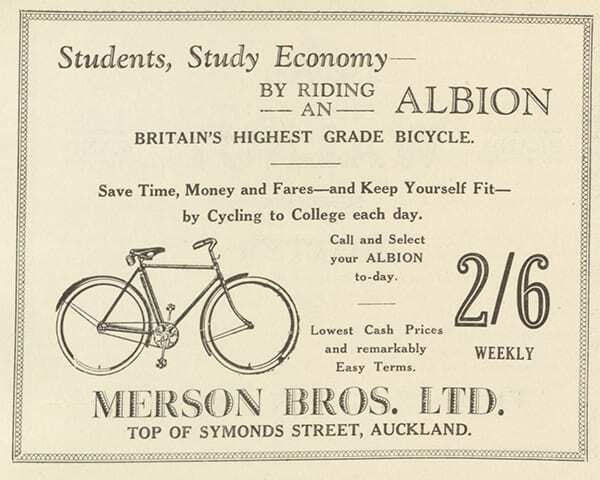 3 Merson Bros. Ltd. print advertisement for ‘Albion’ bicycle. (1933, Vol. 28), Kiwi, n.p. NZ Glass Case 378.95 K62. Special Collections, University of Auckland Libraries and Learning Services. 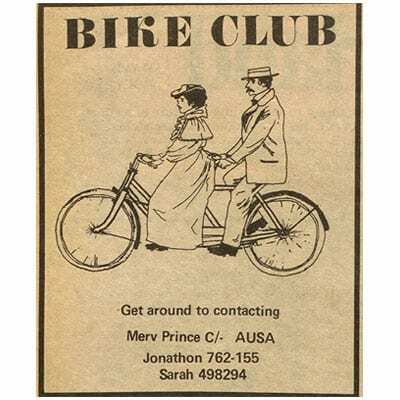 4 Newsbriefs: Cycle Users Club. (1976, 2 August). Craccum, p.7. NZ Glass Case 378.95 C88, Special Collections. 5 Ecology Action bike ride. (1977, 7 March). Craccum, p.3. 6 Letters. (1977, 14 March). Craccum, p.2. 7 Take note: bicycle racks (1978, 26 June). Craccum, p.3. 8 Two wheelin’ (1979, 19 March). Craccum, p.9. 9 Cycling into the 80’s (1980, 3 June). Craccum, pp.11-14. I sadly note that now, as back in 1980, there is still no mention of a bike path to and through South Auckland. This seems like a major flaw in the master plan of being able to cycle the length of New Zealand, if you can’t safely cycle from the CBD to the Bombay Hills. Until that gets sorted, I will unfortunately have to remain safely ensconsed in my car, as public transport to parts of South Auckland is nearly as bad as the cycle paths.